If you're an application developer or planning to become one, it's a good idea to take a look at what your peers are making before negotiating your salary. In 2011, the median salary for software application developers was $89,280. However, your experience, certifications, where you live and the company you are applying to can all play a role in how much you earn. Software application designers create applications like games and word processing programs, which are used on computers and other electronic devices including tablets, cell phones, and Smart TVs. Because applications are so abundant in the consumer market, many people don't realize that there are many other types of applications used by governments, manufacturers and other businesses. For example, a small business wanting a customized accounting software would hire an application developer, as would an oil company that needs an application to monitor flow levels. The median salary for software application developers in 2011 was $89,280 according to O*NET, which means half of the developers earn more than this figure and half earn less. The Bureau of Labor Statistics last calculated the salaries of software developers in 2010. That year, the median salary was $87,800. The top 10 percent of earners in 2010 made over $133,100, while the bottom 10 percent made under $54,000. 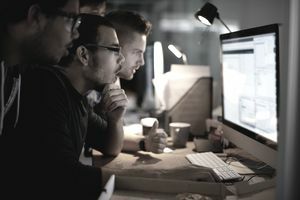 Most companies looking for software application designers require that candidates have a bachelor's degree in computer science, software engineering or other related disciplines. For some positions, a master's degree is required, or experience in the industry for which the applications are needed. Creating applications for an insurance company, for example, may require familiarity with different platforms than creating applications for an automobile manufacturer. Application software developer salaries vary from region to region. It appears to be based on industries in each region rather than simply a question of supply and demand. Ohio, for example, had 21,470 application developers in 2008, more than twice as many as Michigan and nearly three times as many as Alabama. However, the median salary in Ohio comes nowhere near salary leaders like Massachusetts (22,300 positions), Washington (25,000 positions) and New York (26,280 positions). Following are 12 examples of regional median salaries as reported by each State in 2010 and compiled by CareerOneStop. The figures in brackets represent the top and bottom 10 percent thresholds corresponding to the national figures. First-time employees can expect to earn between $30,000 and $68,000 in their first year. Those with up to five years of experience typically earn between $39,000 and $77,000. Those with up to ten years of experience can earn between $49,000 and $91,000. If you have more than ten years experience your salary will generally range anywhere between $50,000 and $133,000. Microsoft Certified Professionals (MCP) represent both the lowest and highest paid application developers, with a range between $43,000 and $126,000, according to Payscale's survey. Microsoft Certified Technology Specialists (MCTS) typically earn between $50,000 and $72,000. Microsoft Certified Application Developers earn between $64,000 and $93,000. Sun Certified Java Programmers (SCJP) generally earn between $58,000 and $93,000. Oracle Certified Associates (OCA) earn between $68,000 and $76,000. A Payscale survey of application developers has estimated that J.P. Morgan Chase typically paid between $54,000 and $107,000 in 2012. Oracle Corporation pays between $71,000 and $96,000. The Walt Disney Company pays between $58,000 and $67,000. Some developers working for these firms may make more or less, as the figures are based only on those who volunteered their income. Few small to mid-size companies pay over $100,000. Those making over $100,000 are usually self-employed or work for usually work for companies with more than 5,000 employees. In the United States, there were 520,800 software application developer positions in 2010. This should grow by 28 percent by 2020, with an estimated 664,500 positions. Each year there will be an average 19,790 job openings for software application developers until 2020, due to the creation of new jobs and employ replacement. Applications for mobile technologies like tablets and cell phones should continue to experience a lot of growth according to the Bureau of Labor Statistics, as should the healthcare industry and security software applications. As more software is made available on the Internet, usually at lower costs than traditional CD or DVD distribution models, there should be more demand for application designers to not only create new software but to help businesses customize the software they have. Many companies are focusing development on cross-platform applications that can be easily migrated from a computer to a tablet or cell phone with a minimum amount of customization. The Bureau of Labor Statistics does not expect outsourcing to low-wage countries to have much of an impact on domestic jobs.